Commercial or Residential Roofing in North Texas is our specialty. We have been back in the roof and fence business for over 10 years now. We are listed on Angie’s List, Merchant Circle, Home Adviser, Thumbtack, etc.. as well as several other sites with a better reputation than our competition. We have won the Best of Denton for the last 4 or 5 years, for taking care of our customers and providing top notch customer service. We treat every single project, (big or small) like it’s ours and we’re picky! Poor fences make bad neighbors. We repair most types of fences as well as install brand new fencing to keep your home looking great on BOTH sides of the fence! We have a solution for every budget and even do combined discounts for neighbors. The more neighbors that install a new fence, the cheaper it is on everyone. Our commercial fences are built to keep anything out that is not supposed to be on the inside. Call us today and let us see if we can get your new fence installed soon. Integrity is not a word you hear very often these days and its a shame. To have integrity means you stand behind your work, your products and make it right when it’s wrong. That way, the customer is satisfied and feels like they paid for a quality job. The roofing business has a bad reputation for not treating customers right and simply not doing quality work. We are leaders in this industry locally and want to be an example for others in this business. Hopefully, we change it, one owner at a time. When you need it fixed and fixed right! Texas Roof and Fence was started with one thing in mind, to take care of customers with the highest quality of customer service and satisfaction in the construction, roofing and fencing industries. We hear about others that claim to be, “just like Texas Roof and Fence”. Well friends, we are Texas Roof and Fence and we can’t be duplicated. We take take pride in calling our customers, “friends” and will go the “extra mile” for them. Texas Roof and Fence is based and operated from Denton, Texas. The owner, Steve Ormand is a 1982 graduate from Denton High School. We service all customers, commercial and residential in Texas. Our services range from roof and fence repairs to new roof construction and fencing installations. We know that our customers have to live with our work for years to come, that’s why we do the very best from the start. We protect you from the “Storm Chasers” and “Fly by Night” Roofers. If they cover deductibles, they are putting you in a bad position. See this website http://freeroofscam.org/ BE EDUCATED and you will get a good roof at a fair price! We are fully insured and have hundreds of references. Before you let anyone work on your house, ask for insurance and check the Better Business Bureau. Here is our listing at www.bbb.org. It only takes a few seconds. If your potential contractor is not listed at the BBB, you may want to re-think hiring them for your project. 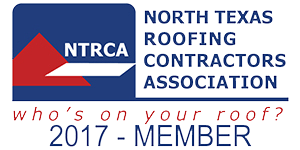 We are also members of the North Texas Roofing Contractors Association. Make sure your contractor is as well. It is the closest thing we have to being licensed in Texas. At NTRCA, you must carry insurance, have no type of arrest records and be sponsored by at least 3 other companies that are already members. If your potential contractor is a member at NTRCA, you know that you are getting a company that had to pass stringent member qualifications. Do you need an estimate? Below, you will find 4 different estimate buttons. Click the one you need, fill out the information and we will call you to setup an appointment. If you have a general question, use the “Contact Us” button here. There’s a reason we continue to win or at the very least, place in the top 3 Roof and Fence Contractors in Denton Texas. That reason is simple. We treat EVERY job like we own it and we have very high standards. What that means for our customers, is the very best materials at affordable prices with quality at every turn. Customer service is our TOP priority and it shows with multiple awards being won every year. Give us a call on your next home repair project and we’ll show the difference when your contractor cares! This year, we won the Best Fence Company and was the Runner Up for the Best Roof Company. The Right Choice For Roofing and Fencing. There are so many fly by night roofing companies that will take your money and run with it, that our main mission is to protect our customers from these companies. They will leave you broke with major damage to your roof and no money to fix it. At Texas Roof and Fence, we stand behind our work, the products we use and our employees, 100%! Making Texas Roof and Fence the RIGHT CHOICE for all of your home repairs. We do more than roofs and fences. We will travel out of our base service area for our customers on an “As Needed” basis. and many other places around the area. We service these areas and more. Call us at 940-239-0337 for a free inspection report and estimate.